It’s SRO time at the BNP Paribas Open here at the Indian Wells Tennis Garden. On this unseasonably cold day, people stand on the top row and others push through the crowd on the ground to get a glimpse of the action. A crane camera hovers overhead while another camera moves up and down the side of the court. And this is only the warmup. Roger Federer’s warmup. He gently jogs around half the court and casually hits a few forehands and backhands as the crowd grows. It’s men’s semifinals day and we’ve got four slam winners in four semifinals slots and we are psyched. I bet there’s a stat for that right? Last time Indian Wells had four slam winners in the semis. Last time a slam had four slam winners in the semis. Must have been a while ago because these are the only four players who’ve won a slam since 2005. We start with Rafael Nadal and Juan Martin Del Potro. I’ll write about Federer and Novak Djokovic in my next post. Del Potro is lucky this isn’t a slam. He’s reached #90 in the rankings after getting as high as #4 then missing almost all of 2010 after a wrist injury. Best of five sets on a fast court against Nadal can be torture. Nadal is playing his first event except for two Davis Cup matches since he injured his thigh at the Australian Open. Del Potro gets out to a fast start winning the first three games then something strange happens. Rafa hits three lets in a row then a fault and by the time the fifth serve comes, Del Potro muffs it. Tired of waiting I guess. It breaks Del Potro’s rhythm but he manages to hold his next service game to go up 4-1. Del Potro’s defense is impressive. He gets around the court so quickly and gracefully given his 6’6” (198cm) frame. He’s kind of like those 6’6”, 250 lb. (113kg), linebackers in US football who run the 40 yard dash under five seconds and jump out of the gym. Football has to keep changing it’s rules to prevent these fleet behemoths from killing someone. If the players keeps growing, maybe tennis will have to make an adjustment. Raise the net maybe? They do something similar in basketball. The women pro players have a smaller basketball than the men. Unfortunately, I was marveling at Del Potro’s defense because he’s now playing too much of it. Rafa is starting to dictate points and when he gets a break point in the sixth game, he hits a short shot to bring Del Potro to the net then passes him to get back on serve at 4-3. Del Potro beat Rafa the last three times they met, all on hard court. 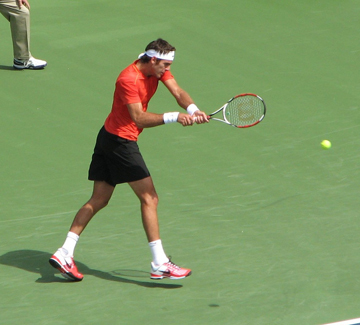 But that was before Rafa started hitting serves in the high 120s and learned to flatten out his forehand. At the post-match media session, Rafa added two more improvements: “my backhand is better” and “I am playing closer to the baseline.” Rafa breaks Del Potro with a good return of a 133mph (214kph) serve and goes up a break at 5-4. At this point it’s hard not to think that this set it toast for Del Potro. Those US footballs players run the 40 yard dash in the Scouting Combine, an event that leads up to the annual NFL draft. Teams are looking for a number of things in a player – can he run fast, jump high, and lift tons of weight? Does he play his position well? And one more thing – is he a playmaker? Can he make a play when the team needs it most? Rafa’s a playmaker. Maybe it’s the ace he hits to close out the first set 6-4. Or maybe it’s taking a game point away from Del Potro then hitting a gorgeous passing shot to go up a break in the second set – about which Del Potro said, “I made my best forehand, but he made a better passing shot.” Del Potro is more of a grinder – a slam winning grinder but nonetheless, a grinder. He pummels you till you go down rather than coming up with those signature shots that pull a match out of the fire. After that break in the second set, Rafa holds and goes up 4-2 and I go off to lunch. We’re seeing some great points today but I can see the outcome already. Rafa beats Del Potro 6-4, 6-4, and is into the final. Oh, the last time we had four slam winners at this event: 1995. The last slam with four slam winners in the semis: 2005. See you in a minute for Part II.